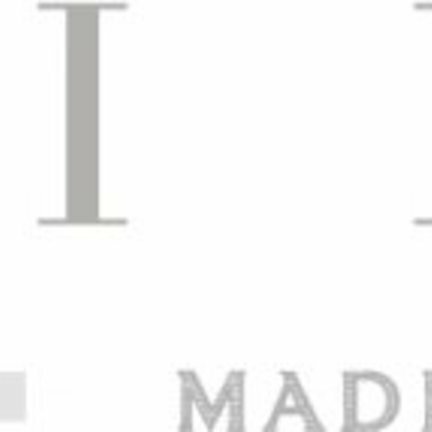 The Amalfi story is one of artisan craftsmen dedicated to a by-gone era when it meant something to be a “Master Craftsman.” Since our founding in 1955, we have been true to our dedication to create heirloom quality furniture. 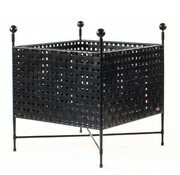 Through the 1950s and 1960s, we imported all of our furniture from Italy. By the 1970s, our local craftsman’s work mirrored that of their European counterparts, so we began making the furniture stateside to have more input in the design process. Today, many of our craftsmen are now second generation Amalfi Master Craftsmen, still making each piece by hand; one at a time. 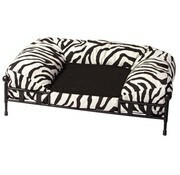 Handcrafted from solid steel this luxurious dog bed features a framework with sleek lines and a plush cozy cushion for added comfort. Available in grande or petite sizes. The Amalfi Tuxedo Salon is a deep seated comfort line which can be placed in a myriad of arrangements. 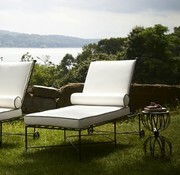 This outdoor lounge grouping features lounges with backs, backless lounges and a salon ottoman. This outdoor deep sofa features deep seated cushions for maximum comfort and finials for added elegance. The framework is handcrafted with sleek lines, highlighted by a bold pattern on the sides, seat and back to contrast the cushions. The Amalfi Round Back Armchair features a round back and arms topped with finials for added elegance.The framework is handcrafted with sleek lines, highlighted by a bold square pattern on the seat and back to contrast the cushions. This outdoor sofa features deep seated cushions for maximum comfort and finials for added elegance. The framework is handcrafted with sleek lines, highlighted by a bold square pattern on the seat and back to contrast the cushions. 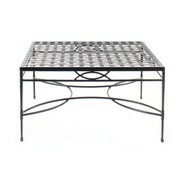 This luxurious coffee table is handcrafted from solid steel and features a woven patterned table top. 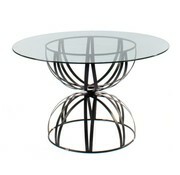 Use our table as is or place a piece of tempered glass or stone slab atop of the woven pattern. 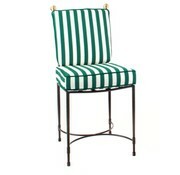 The Amalfi Host Chair is perfect for dining. 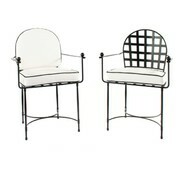 This outdoor dining chair features deep seated cushions for maximum comfort and finials for added elegance. 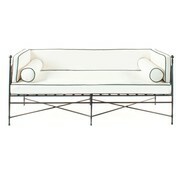 The framework is highlighted by a bold square pattern on the seat and back to contrast the cushions. 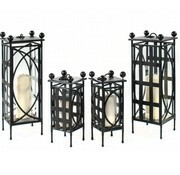 The Amalfi Candle Lanterns are handcrafted from solid steel. The top of the lantern is removable for easy access to the candles. Available in grande or petite sizes. These candle lanterns are the perfect accent to any outdoor setting. The Amalfi Backless Dining Bench provides a modern seating solution for large and small tables. 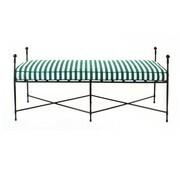 This dining bench features thick cushions for maximum comfort and finials for added elegance. 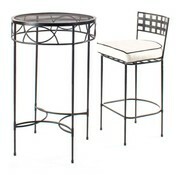 The Amalfi Bar Stool is handcrafted in solid steel and features a bold square pattern on the back. A deep, soft cushion provides extra comfort while contrast piping back adds a touch of elegance to the chair. The Amalfi Tuxedo Salon Set is a deep seated comfort line which can be placed in a myriad of arrangements. 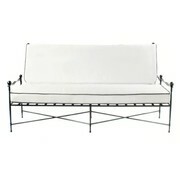 This outdoor lounge grouping features lounges with backs, backless lounges and a salon ottoman. 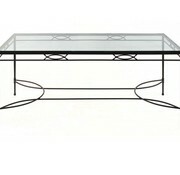 The Amalfi Rectangle Dining Table is handcrafted from solid steel and provides sturdy support for a glass or stone slab table top. Pair this dining table with our side & host dining chairs for a luxurious backyard setting. 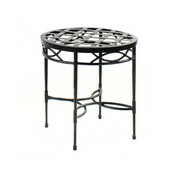 The Amalfi Side Table is handcrafted from solid steel and features a woven pattern top. 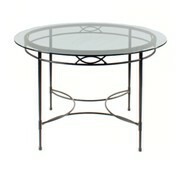 Use our side table as is or place a piece of tempered glass or stone slab atop of the pattern. 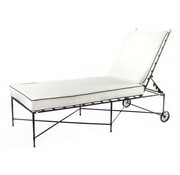 Pair it with our chaise lounge chairs for a luxurious backyard setting.